"Which car is best for me?" "What safety features should I be thinking about?" "Is this a good deal?" As Canadians pull out their smartphones to answer these questions and conduct research, schedule test drives, and find dealerships, here are ways your brand can stay along for the ride with car buyers. The wheel, the bike, the automobile—like the great inventions before it, mobile continues to build upon its own potential. As smartphones inform the purchase decisions of billions of consumers worldwide, marketers are working around the clock to find new ways to meet the needs of these always-on customers. One result of consumers becoming increasingly mobile is that they're now researching and making large purchase decisions on their smartphones, and that's good news for car companies. Mobile can inspire shoppers to consider your brand, recite safety specs and MPG for all models at the drop of a hat, and even send potential buyers on virtual test drives in their living rooms. These days, a mobile presence can be your brand's hardest working and most impactful brand ambassador. These mobile moments offer car brands countless ways to turn inquires into actions. Mazda Canada knew mobile is one of the best ways to connect with car buyers throughout their purchase journeys, as 37% of its site traffic comes from smartphones and that number tops 50% when tablets are taken into account. In order to reach and connect with these valuable mobile consumers, Mazda set out to improve its mobile presence and reach mobile consumers. Here are the five key micro-moments we've identified along the car buyers' paths to purchase and how Mazda drove conversions in each. Mazda Canada implemented a transformative mobile bid strategy to reach shoppers throughout their journey using a range of related keywords. This allowed Mazda to actively work to maintain top positions for mobile searches throughout the year. Google Canada/Ipsos, "Think Auto Canada 2015 Car Buyers Research," July 2015, n=3000. Modern consumers are strapped for time, and the car buying journey seems to get shorter every year. Today, car buyers want to gather and evaluate as much information as possible before heading to the dealership. And they can, thanks to innovative new tools like 360° videos on YouTube. These videos enable brands to give car buyers the "up close and personal" experience they're looking for before they head to the dealership, and consumers are taking notice. To help consumers looking to make the perfect choice, Mazda revamped its mobile site to make it simple for consumers to compare prices and book test drives anywhere, anytime. The mobile-friendly site navigation allows on-the-go consumers to compare competitors, request a quote, download a brochure, or build and price a vehicle. Mazda also noticed that car buyers are more likely to use their smartphone to book a test drive than car shoppers, so it worked to ensure it is showing relevant ads in top positions at the moment a potential customer may be looking to test drive a Mazda vehicle. Mazda recognized consumers' needs to compare and validate prices, even seeing that customers compared prices while standing at a Mazda dealership. So its mobile site now includes helpful comparison tools, showing buyers detailed comparisons on things like horsepower, technology, warranties, and certainly, price. Mazda ensured its mobile-optimized site made it easy for customers to find a dealer based on name, location, or postal code. Mazda Canada and TeamMazda (consisting of Excelerator Media, a division of Mindshare Canada; Catalyst Canada; and J. Walter Thompson Canada) partnered with Google to reach users within a specific radius of relevant dealerships with location extensions. This way, mobile customers could easily get directions or call a dealership directly. Combined with higher mobile bid multipliers (an increase of 85% on their previous mobile bid) and call extensions, the mobile-optimized site directly contributed to a high volume of phone calls to dealers as well as consumers looking for directions on search and Google Maps. Google Trends, April 2015 vs. April 2016, Canada. Mazda used click-to-call ads to make it easy for consumers to call quickly and confirm that the dealer near them has their chosen vehicle available at the best price. 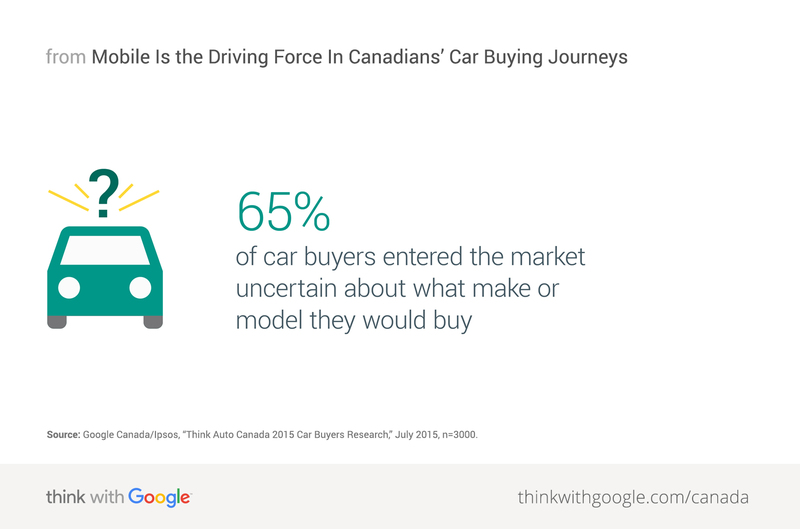 Google Canada/Ipsos, "Think Auto Canada 2015 Car Buyers Research," July 2015, n=404. Mazda's redesigned, fully responsive mobile site along with its dedicated paid search strategy allowed the brand to connect with car buyers in their key mobile moments. The campaign drove a 61% increase in mobile conversions and a 20% increase in mobile spend. Mazda also saw a 75% improvement in mobile conversion rates at a 25% lower cost-per-conversion. Meeting consumers in their car buying micro-moments paid off big for Mazda. Think of ways your brand can follow suit by being there, being quick, and being useful for Canada car buyers. 1 Google Canada/Nielsen, "Mobile Search Moments Canada, Auto Category," March 2015, n=131. Conversions include visit a store/ business, made a purchase, downloaded something, took a photo. 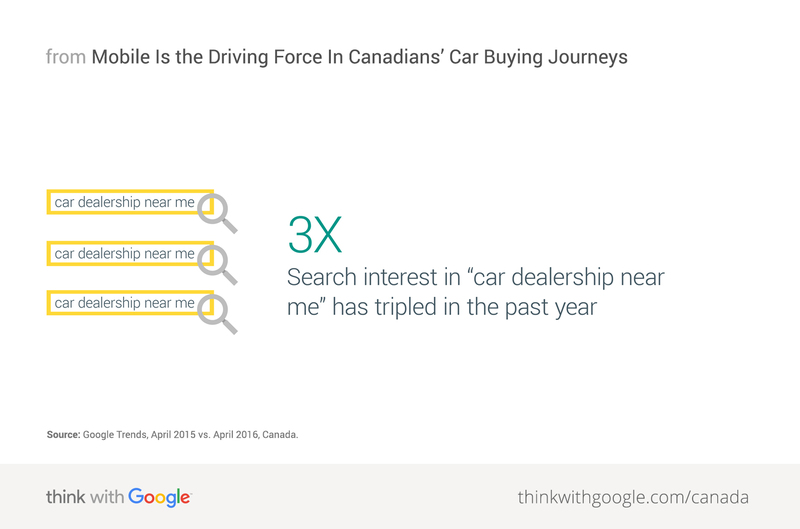 2 Google Canada/Ipsos, "Think Auto Canada 2015 Car Buyers Research," July 2015, n=3000. 3 Google internal data, 2014 vs. 2015, Canada. 4 Google Trends, 2014 vs. 2015, Canada. 5 Google internal data, 2015, Canada. 6 Google Trends, April 2015 vs. April 2016, Canada. 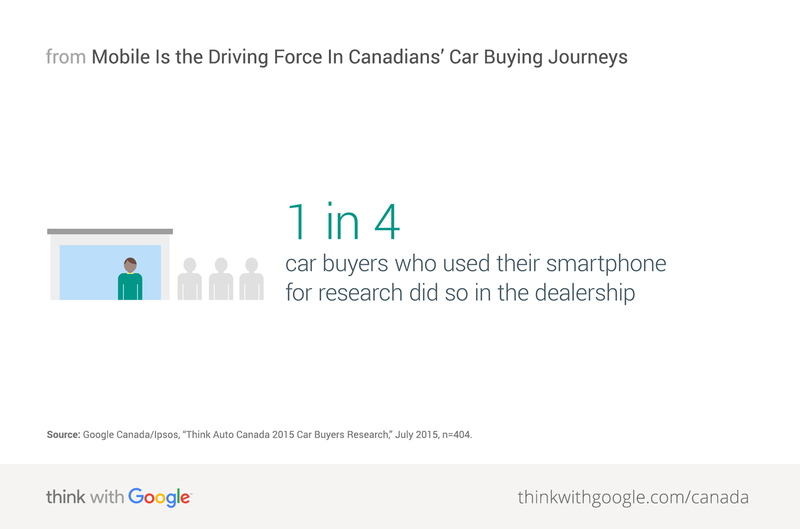 7 Google Canada/Ipsos, "Think Auto Canada 2015 Car Buyers Research," July 2015, n=404. 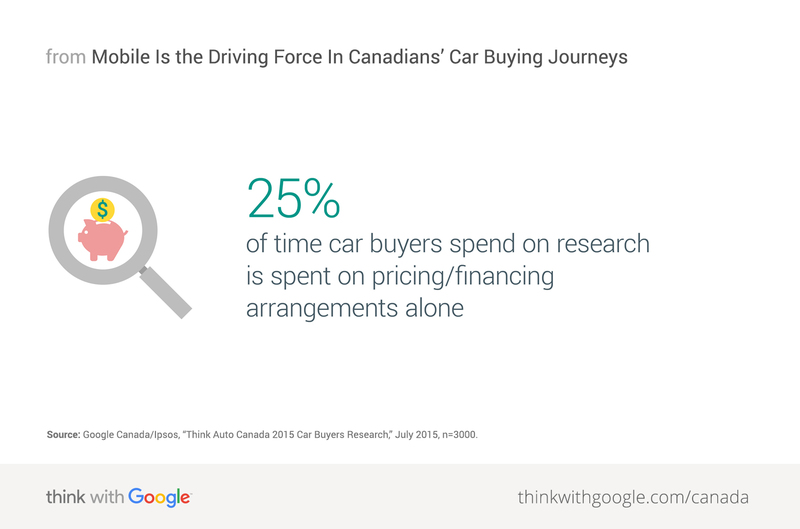 8 Google Canada/Ipsos, "Think Auto Canada 2015 Car Buyers Research," July 2015, n=253.